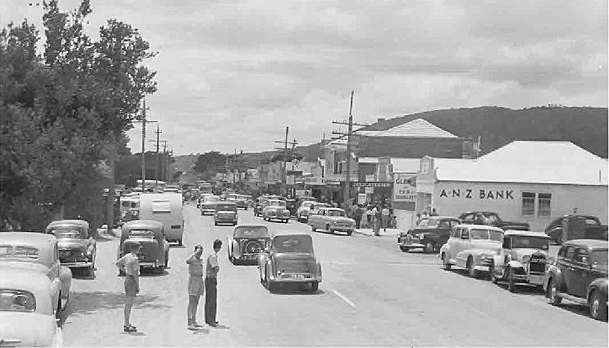 The picture below is of Boneo Road, Rosebud, not far in from Nepean Highway (now called Point Nepean Road). 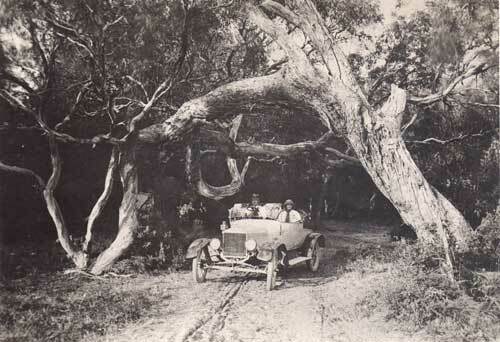 The T-Model Ford was owned by Bert White (he’s also in the picture below, holding the tangle of rope), and the tree had grown over the road, been blown over a little more as far as it would go as a branch was jutting out, and the branch more or less took root on the other side and started growing upwards again. This car was one of the few in Rosebud for a while. The picture hung above the stove in the fish shop house (more elsewhere) for as long as I recall. The above picture was taken around 1920. The fellow playing the organ is Charlie Burnham, and the kid in the foreground is his son Stan (my Dad). 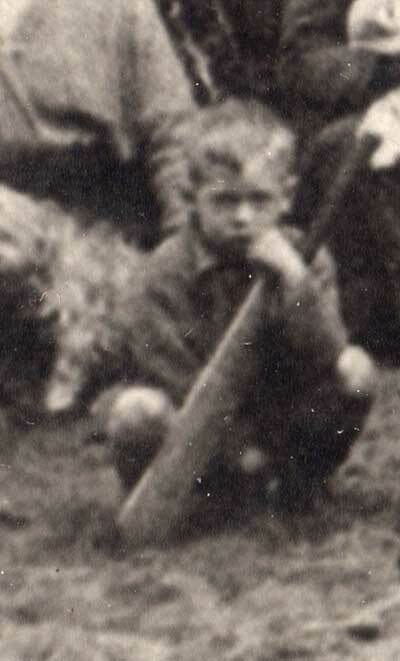 That’s him below, the little tacker with the cricket bat. His brother Roy is two over to the right, with a cap on. 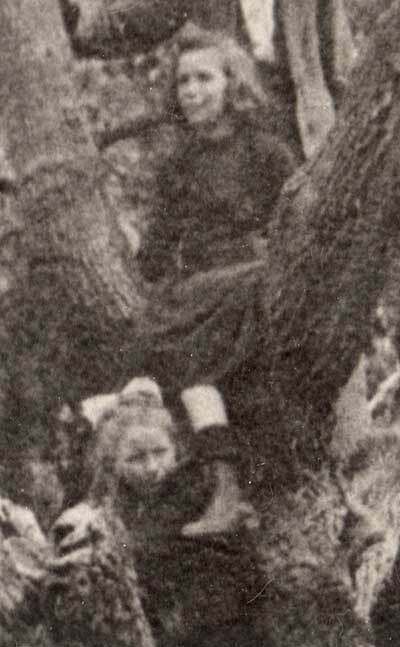 And further to the right, kneeling in front of the lady who is side-on and looks like she’s knitting, is Vin Burnham. 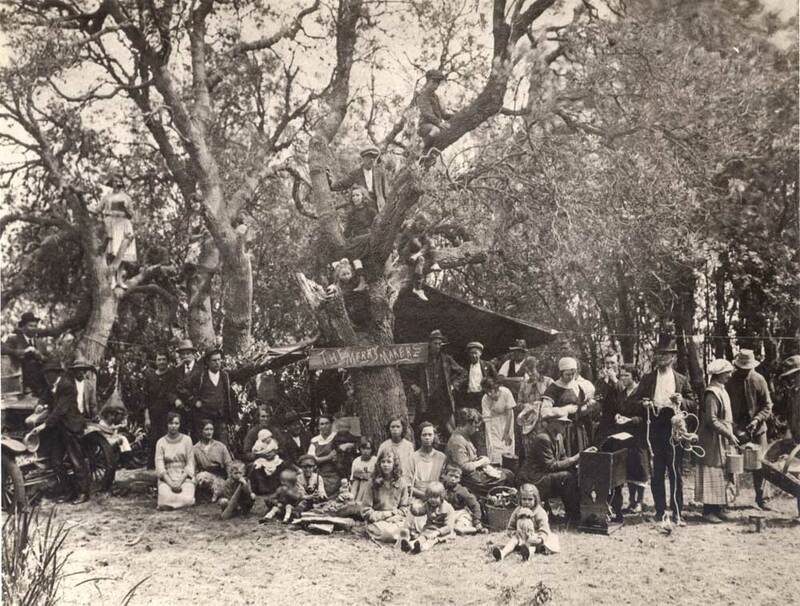 The two girls directly above The Merry Makers sign, in the tree, are their sisters Iris and Dolly. Vin’s son Neil tells me that Iris is the lower one, and he also says that their cousin Wally Burnham is the one sitting on the branch to their right. He was the son of Charlie’s brother Walter. The car belonged to Arthur Mohr, as was pointed out by his granddaughter Val (now Val Beck). Val’s dad George is one of the other boys up the tree. This is all I know as far as identities goes. If anyone has more clues, please let me know, thanks. 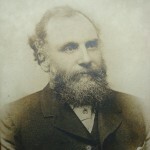 Above is Charlie Burnham, but I have no date for this photo. It was among Dolly’s collection. 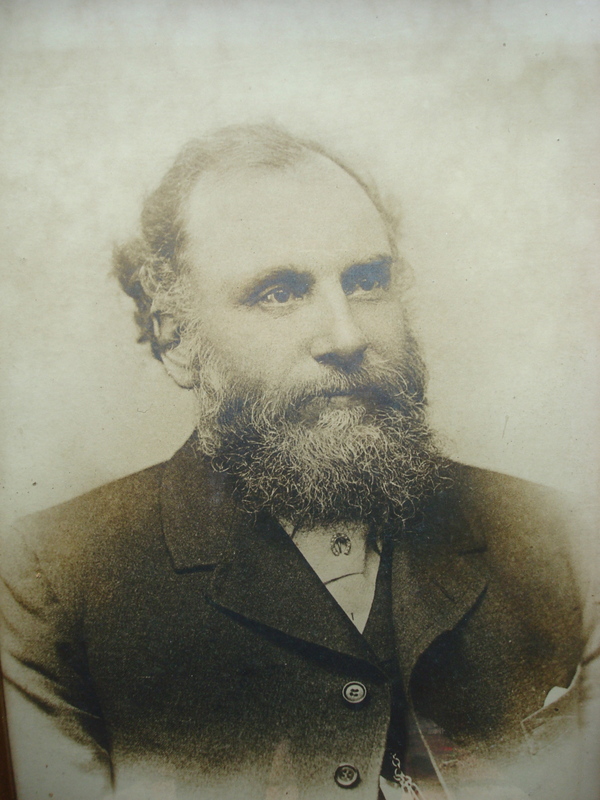 And the fellow to the right is his father George, who arrived from Shoreditch in London in 1866. 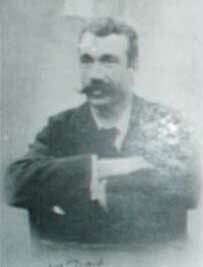 He lived in Emerald Hill (South Melbourne) and died in 1901. This portrait hung in the fish shop house for years. 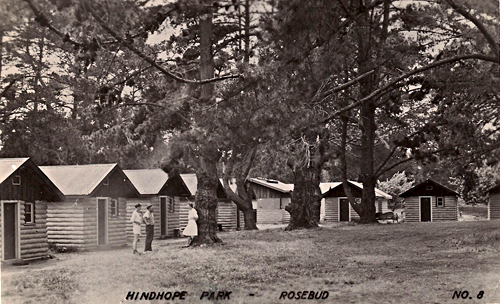 Below is Hindhope Park, picture supplied by Ray Gibb. 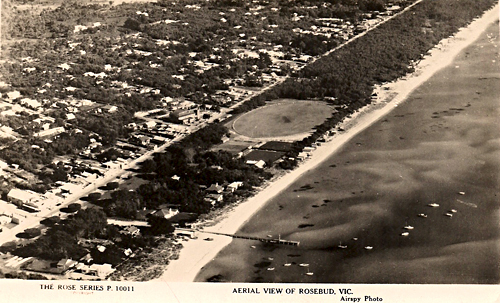 And here is an aerial photo of the Rosebud jetty, with the footy ground beyond, also supplied by Ray. 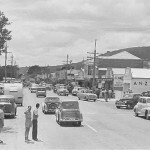 An undated picture of Rosebud main street (looks like 1950s?). From Val Beck.